Intel's high-end desktop (HEDT) strategy has been overhauled after a long time. 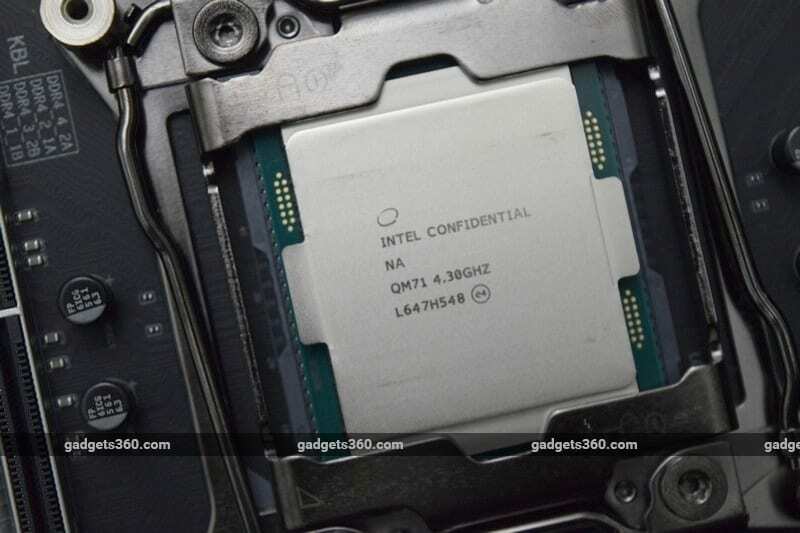 For the past few years, Intel has taken the architecture that served for the previous generation of processors and beefed it up with more cores, more connectivity and higher power and thermal thresholds. However, the increasing gap between mainstream and high-end launches, and fresh competition from AMD's Ryzen and Threadripper lines, has forced Intel to make a change. The result is that we not only have last year's Skylake architecture coming back in the form of Skylake-X as expected, but also this year's Kaby Lake turned into Kaby Lake-X at the same time. Both have been clubbed into one family of products called Core X-series. We've covered the differences and similarities between the two in our exhaustive guide to Intel's Core X-series, which you can read right here. You can also check out our review of the 10-core Skylake-X Core i9-7900X for more detail. In short, Skylake-X is the more powerful of the two, following the standard template, while Kaby Lake-X is a curious new twist that's sandwiched in between mainstream CPUs and the new many-core models. Its value proposition is somewhat confusing, and its target market is incredibly niche. Today, we're looking at the more powerful of two models, the Kaby Lake-X Core i7-7740X to see what the other side of Intel's new strategy is all about. There are only two Kaby Lake-X processors, in contrast to seven Skylake-X models. Both have four cores, but only the Core i7-7740X gets Hyper-Threading, while the Core i5-7640X does not. They slot in right above the Core i7-7700K and i5-7600K respectively, and are essentially just faster versions of those two processors minus the integrated graphics capabilities. They're designed to fit into the same LGA-2066 socket as Skylake-X rather than the standard LGA-1150 used by mainstream models, so that they can draw more power and generate more heat. However, they can't take advantage of any of the X299's best features. The most important thing to know is that Kaby Lake-X processors can address only 16 lanes of PCIe bandwidth and two channels of DDR4 RAM - the same as all mainstream Core CPUs. In contrast, top Skylake-X models can handle 44 PCIe lanes and quad-channel RAM. Since motherboard manufacturers don't know which CPU you're using, they default to supporting the full spread of features for maximum compatibility, which means you're paying for a lot of things you can't use. The Core X-series name hardly seems meaningful, but this is the positioning that Intel saw fit to go with. You won' t be able to run multiple graphics cards or high-speed SSDs, and half your RAM slots will remain empty. If you don't know exactly what you're doing when building your PC, you might end up with parts that just won't work all at the same time. Intel thinks this is a good thing because people can buy an inexpensive Kaby Lake-X CPU now and upgrade to Skylake-X later, but we don't think that's likely to happen because you'd need to buy new RAM and other components to take advantage of the upgrade. Lower-end motherboards catering only to the subset of features supported by Kaby Lake-X, ditching upgradability altogether, are expected to launch later this year. The cost of entry will go down, but there's bound to be even more confusion in the market. Both Kaby Lake-X processors are rated for 112W TDPs rather than the 91W ceiling for overclockable K-suffixed models such as the i7-7700K and 65W for the less adventurous multiplier-locked ones such as the i7-7700. The Core i5-7640X has a base speed of 4.0GHz and a boost speed of 4.2GHz, while the Core i7-7740X runs at 4.3GHz and 4.5GHz respectively. Interestingly, these speeds are higher than many of the Skylake-X parts, partly because of their newer base architecture and partly because the smaller number of cores can be given a more generous thermal allowance. Overclocking is one of the key appeals, and Kaby Lake-X is being pitched at those who want to overclock but don't have very high budgets. As opposed to the astronomical prices of Skylake-X parts, the Core i5-7640X comes in at around Rs. 20,150 including taxes, which is just a little more than the Core i5-7600K's price of Rs. 18,500. Similarly, the Core i7-7740X costs Rs. 27,950 which is practically the same as the Rs. 27,890 street price of the Core i7-7700K. The required X299 motherboards are going to cost a lot more than similar Z270 models. 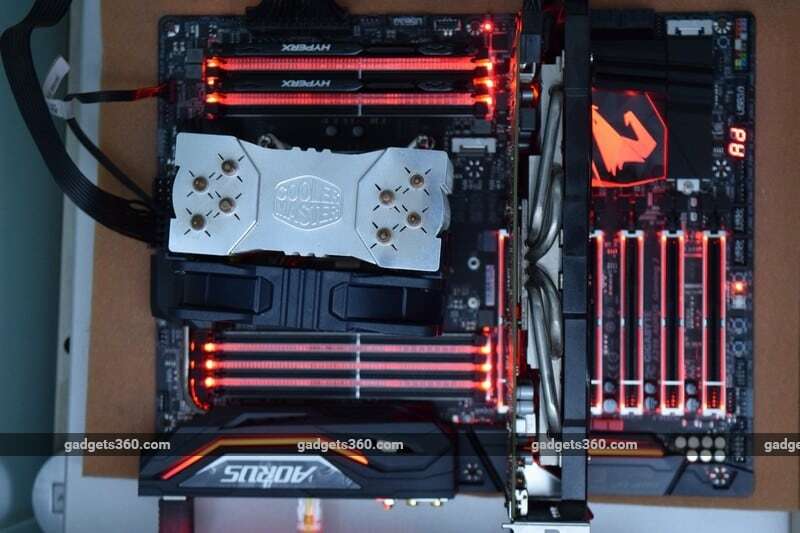 Gigabyte sent us its top-end X299 Aorus Gaming 7 motherboard, which is targeted at buyers who want a rock-solid, feature-rich base on which to build a seriously powerful PC. It arrived in an oversized box with dozens of features highlighted on the rear, including RGB Fusion lighting effects, ehanced audio and networking, fan control, and construction quality. Gigabyte is actually promoting Aorus as an independent premium brand, and its own name is quite heavily downplayed. The board looks pretty impressive even sitting on its own. It's all black and grey with chrome accents, and every square millimeter looks completely packed with components. You'll immediately notice the thick silver shrouds around the RAM and PCIe slots, and the fact that all PCIe slots are phyiscally full-length. This doesn't mean that they're all wired for 16 PCIe lanes - if you look closely, you can see that the metal contacts only go all the way in two of the slots while one other is wired for x8 and two are only x4. Slot bandwidth is even more restricted for 16-lane Kaby Lake-X users, so don't be too impressed by the appearance of so many full-sized slots. There are three M.2 slots, all horizontal. One is next to the X299 PCH and has an oversized heatspreader, while the other two straddle the first PCIe slot and will be difficult to access once your system is fully built. One of the M.2 slots shares bandwidth with the x4 PCIe slot, and all of them affect the avialability of the board's eight eight SATA 3.0 ports to different extents. You have to check the manual thoroughly to see which combinations of ports and slots are available, and we think that Gigabyte could have done a better job of consolidating and presenting this information. As a sidenote, Intel Optane Memory is supported. Since it's targeted at low-end PCs and enthusiasts are better off with an SSD, it's fairly pointless. The rear panel has four USB 3.1 Gen 1 (5Gbps) ports, two of which can be overvolted for use with audio devices, and one of which lets you flash the BIOS. Then there are four USB 3.1 Gen 2 (10Gbps) Type-A ports and one Type-C port. You also get two Gigabit Ethernet ports, one PS2 keyboard/mouse port, S/PDIF audio out, five reassignable 3.5mm audio ports, and two terminals for a Wi-Fi antenna. There are internal headers for one more USB 3.1 (Gen 2) port plus two more USB 3.1 (Gen 1) and four USB 2.0 ports, plus a header for an add-on Thunderbolt 3 card. There's also Wi-Fi ac and Bluetooth 4.1. Killer networking allows the two Gigabit Ethernet ports and the Wi-Fi controller to be ganged up to maximise bandwidth. Audio is powered by a Realtek ALC1220 codec which allows for 7.1-channel output, and an ESS Sabre 9018 DAC. Some of the USB ports at the front and rear can be overvolted by up to 3V to help drive audio devices. Gigabyte calls its power regulators "server class", and of course there are various brand-specific trademarks to denote high-quality components, versatile cooling controls, and the quality of its manufacturing process. What we like most are the little things - the diagnostic LEDs that show system temperature after booting, the OC controls, and the lighted IO cluster backplate. Motherboard software tends to be unnecessary, intrusive and poorly designed, and Gigabyte's is no exception. The company is trying though, and its App Center is designed to be modular so you can get rid of bloat that you don't want. You need the RGB LED applet unless you're happy with static red lights everywhere, and the BIOS update tool could come in handy if you're not comfortable with BIOS flashing, but most of the 21 modules can be ignored. The main tool is the EasyTune utility, which offers one-click overclocking and a stress test to see how far your PC's power and cooling capabiltiies can be stretched. With all of this going on, the thing that Gigabyte is making the most noise about is RGB LED lighting effects. 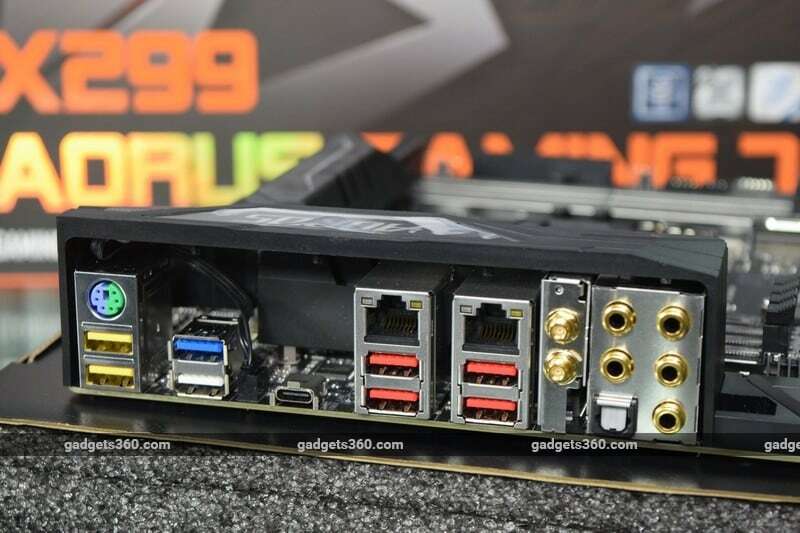 An incredible amount of effort has gone into this seemingly frivolous feature, but hey, that's what buyers want and Gigabyte is delivering by the boatload. Every single slot on this board lights up, and there are additional lights under the PCH and VRM heatsinks and along the IO cluster shroud. Gigabyte's software can sync with other compatible devices and if that wasn't enough, there are three headers so you can plug in additional LED strips to make your case light up like a christmas tree. The sofware lets you set different effects for each zone, and there are plenty to choose from including reactions to music, temperature, fan speed or even network speed. While the Kaby Lake-X CPU looks a lot like its bigger Skylake-X sibling, it doesn't require liquid cooling so we're making do with our trusty single-fan Cooler Master Hyper 212X air cooler. Thanks to the reinforced LGA-2066 socket (which is physically compatible with LGA-2011 coolers), there's no need for a backplate and so installation is much easier than on mainstream motherboards. We had to consult the motherboard manual quite a few times to make sure our dual-channel RAM sticks were in the correct slots and that our SATA and PCIe devices weren't in conflict with each other. After that, everything including software installation was effortless. Without the Gigabyte software, all LEDs stay permanently lit up in red, which is at least better than an annoying animation. Compared to the Kaby Lake Core i7-7700K, the advantages of this CPU are its higher speeds and thermal headroom, allowing it to run faster for longer. Beyond that, we aren't expecting huge performance gains. This CPU also looks quite timid up against the 10-core Core i9-7900X and 8-core Ryzen 7 1800X, but some workloads should actually favour faster cores, and we're here to examine value for money in addition to just raw performance. From these test results, it definitely looks as though there isn't a direct correlation between price and overall performance. The quad-core i7-7740X is in some cases equal to or better than the much more expensive 10-core i9-7900X. As we suspected, the fact remains that there are a few workloads that favour fewer, faster cores or take advantage of the architectural advances in Kaby Lake-X as compared to Skylake-X. Gaming in particular is not massively multithreaded, and unless you're doing several things such as livecasting and encoding video alongside, you don't really need to spend on a very high-end CPU. You can also see a correlation between the i7-7740X and the i7-7700K which are very similar, although there are a few anomalous results in the mix as well. As far as AMD's Ryzen 7 1800X is concerned, you can see the advantages of having eight physical cores plus multithreading when it comes to media encoding, but all of Intel's options retain the advantage in less heavily threaded tasks. Gigabyte allows casual overclocking with the press of a single tiny button on the board itself, as well as through its Windows utility. OC mode instantly shifted us up to 4.7GHz without the slightest fuss, and swapping between this and stock was as easy as tapping the button or clicking a mouse once. There's also an AutoTuning mode which performs the usual stress tests to see how far a system can be pushed, and this mode settled on 4.8GHz for us, fully stable. We ran Cinebench R15 again and noted very modest increases from 196 to 205 points in single-threaded mode and from 988 to 1,042 points in multi-threaded mode. Similarly the time taken for POVRay to run its benchmark dropped from 2:01 to 1:54 which isn't a huge victory. Interestingly, there's also an Eco Mode switch on the motherboard (and control in the software) that will downclock your system more aggressively when it's idle. Kaby Lake-X creates a new market segment, but we're still not sure who its target audience is. The Core i7-7740X is a very fast CPU on its own and can be overclocked easily, but it's expensive and requires a platform that's complete overkill. At least it has a distinct slot at the top of the quad-core hierarchy, whereas the Core i5-7640X is shoved into the middle of the pack. It should seem obvious to tell people that the i7-7740X is too niche to be relevant. You can save a lot of money without sacrificing much speed by choosing a Core i7-7700K and matching motherboard instead. On the other hand, if money is no object and your work can take advantage of multiple cores, Skylake-X is often the better choice. Kaby Lake-X only makes sense for gaming with nothing else going on, or similar tasks that run better with fewer, faster cores. While that seems like a simple enough conclusion, there are two unusual factors working in Kaby Lake-X's favour right now. First, while Intel's official prices peg both Kaby Lake-X chips at significant premiums over their predecessors, their Indian street prices are almost equal. If you do aspire to upgrade to a 10-core or better CPU and are okay with the cost of an HEDT motherboard, that road is open to you for a lot less than you might have assumed. Second, the timing of this launch creates an interesting window of opportunity for buyers. Right now, socket LGA-1150 seems to be at the end of its life, with rumours of six-core Coffee Lake chips all but confirmed thanks to premature online retail listings with photos and specifications. Kaby Lake has no upgrade path, but Kaby Lake-X does. Intel will have to manage a delicate balance, positioning the inevitable six-core, twelve-thread 8th Gen Core i7-8700K against the quad-core, eight-thread Core i7-7740X, but we'll have to wait a little longer to see how that situation plays out. 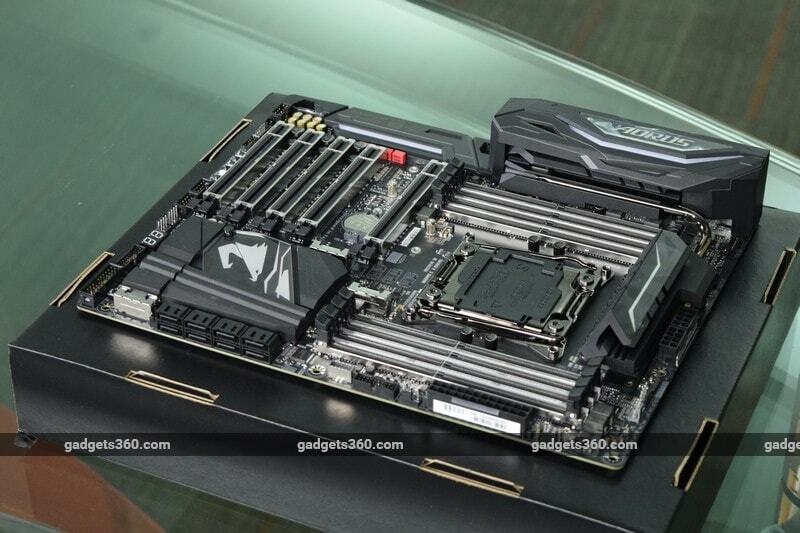 Gigabyte's X299 Aorus Gaming 7 looks like a well built, versatile and feature-rich motherboard that you can splurge on if you want to build a top-end system. It worked perfectly for us with our Kaby Lake-X CPU but looks like it would really take advantage of Skylake-X as well. It has every feature we could hope for, with the exception of Thunderbolt 3. It would also look great with matching RGB components in a huge windowed case. We would like the company to be more clear about how its slots and ports are wired, which would have made building easier. product Intel's Kaby Lake-X architecture powers the more modest members of its new Core X-series processor family. We review the reasonably priced Core i7-7740X.